Every once in a while, a new plant or series of plants are introduced that change the rules. A few years ago, it was the everblooming lilacs that, once established, bloom throughout the summer. Before that, the Itoh peonies that stayed standing in the rain and wind and gave us different colours like yellow and peach. And before that, the daylilies that bloom all summer. 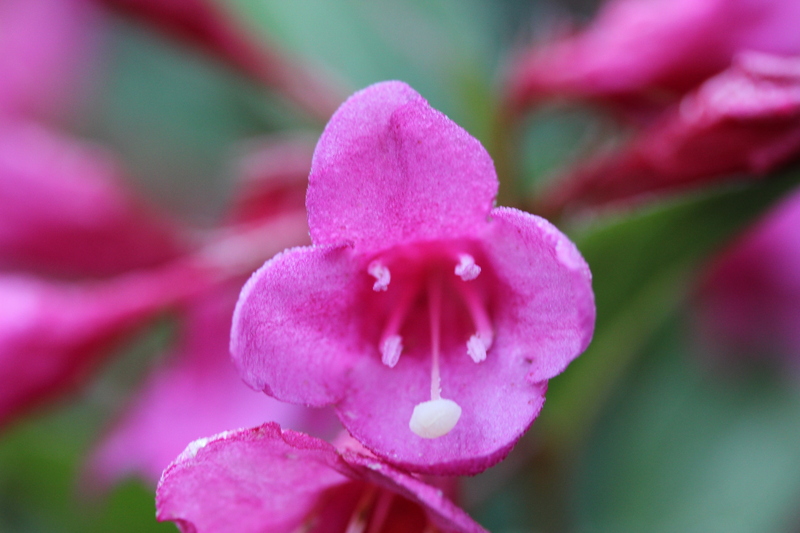 Poised to be the next game changer is a new series of Weigela called Sonic Bloom. Weigelas (pronounced wī-gē’la by the way, but don’t worry, everyone says it wrong – I personally call them wigglies) have been around for ages and you’ll find well-established plants in the oldest of gardens. They’re hardy and very easy to grow. The one to two inch trumpet shaped flowers in red, pink and white are a real show-stopper when they’re in bloom and they attract hummingbirds. Every once in a while, we get a hummingbird stuck in the garage and I make a trail of plants leading out the door to help them escape. Weigelas, when they’re in bloom, are one of the plants that I’ll use. They’ve always bloomed reliably in the late spring and often produce a smaller round of blooms in the fall. My own Weigelas are in full flower at the moment in a garden by my pool that has been completely neglected since I started the garden centre over six years ago. The garden is overrun with weeds and grass and many of the plants that were in there have completely disappeared, or are, at best, struggling. Not the Weigelas. They’re big and full, covered in blooms and have a great shape. That garden has been a great trial bed for what does really well in adverse conditions. When people ask me about no-maintence or low-maintenance plants, I always think first of everything that does well there. This new series of Weigelas come in three flower colours; red, white or pink. They have green leaves and get to be about five feet tall and five to six feet wide. Sounds like a normal Weigela so far? Here’s the kicker. They have a heavy bloom in the spring, followed by “waves of rebloom until frost”. That’s marketing/lawyer lingo for flowers all summer! The heaviest bloom should be in the spring, with the reblooms being lighter and probably some short rest periods in between, kind of like the everblooming lilacs. Dead-heading and pruning are not supposed to be necessary to get the reblooms. While they’re brand new and I have yet to try them (I do have a couple set aside for myself already), I’m confident that Proven Winners has done enough testing to substantiate these claims. These plants are definitely on my must-have list for this year. I can’t stop thinking of how happy the hummingbirds are going to be and hoping that, maybe, hopefully, we’ll see some with wine coloured leaves in the years to come. Okay, that might be a little greedy of me. This entry was posted in Columns, Plant Focus and tagged easy, Garden, Hummingbird, long blooming, Proven Winners, shrub, Sonic Bloom, Weigela. Bookmark the permalink.